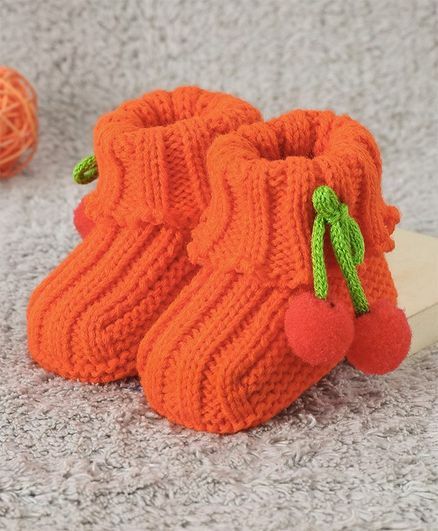 Keep tiny feet warm with these adorable winter wear booties from Cute Walk by Babyhug. The booties are fabricated in soft material keeping in mind the tender skin of the little ones. Designed with attractive colour and eye pleasing pattern, these booties make an ideal option for your child this winter season. Styling Tip: Team this soft pair of booties with any matching outfit to complete the look. Cute Walk Shoes by Babyhug meant for precious little feet. A range of super stylish & comfortable footwear, fine crafted from top quality material. Materials and components are carefully chosen for their quality and lightness, ensuring that no shoes are heavier than the proportional age appropriate weight for the child's body weight.